This weekend there is only one film to see and it stars HARRYHAUSEN, RAY HARRYHAUSEN. We live in an age of the now; where the internet creates trends and sub memes that flare up and die down before most even have a chance to participate - but there are some reassuring constants that don’t waiver. Even though he may have borne of an age when most only heard of a film when it was playing in the cinema rather than every element of it has been dissected and marketed online months before its release – Mr Ray Harryhausen still towers above most when it comes to creativity on screen. If there is one film this year that whose release was a complete surprise to me, but has had me in overdrive since it was announced - it has to be RAY HARRYHAUSEN: SPECIAL EFFECTS TITAN. Previously I have gone on about how Mr Harryhausen is a living legend, how he is one of the most beloved and revered creatives in film and how his work has influenced countless filmmakers over the years. When I say countless filmmakers I don’t just mean aspiring filmmakers I mean film legends, I’m talking about the likes of; Steven Spielberg, James Cameron, Peter Jackson, Terry Gilliam, Tim Burton, John Landis, Joe Dante, Guillermo Del Toro, Nick Park, John Lasseter and the list of those in the know goes on ad infinitum. To say I am a huge fan of Harryhausen’s groundbreaking films is an understatement. I never tire of re-watching them and immersing myself in the fantastical worlds Harryhausen creates – still astounding today - some created over half a century ago. Harryhausen’s work pioneered stop motion and revolutionised filmmaking opening it up to be an even more creative force. Film making would probably be a different beast today without his contribution. Some of my favourite films for my childhood are Harryhausen films like the original Clash of the Titans and Sinbad and the Eye of the Tiger – I love that film but hold some of his earlier films in even higher esteem like the sublime Jason and the Argonauts still a pinnacle in filmmaking and The Golden Voyage of Sinbad, a timeless classic as well as the great Sinbad and the Eye of the Tiger. I am such a fan that every now and then I consider the logistics in sneaking off on a diving trip into the Mediterranean Sea just off Campania, Italy to see if I can salvage and recover some of the lost plaster skeletons or other artifacts from Jason and the Argonauts and return them to Mr. Harryhausen, what a gift that would make. I often wonder what a creative force like Ray Harryhausen would make if he made a film today with access to the current state of the art special effects technology. Would he go retro using his trademark Dynamation and create an ultra polished and slick stop motion film or would he reinvent what we see on screen? The mind boggles. Anyway I can’t wait to see RAY HARRYHAUSEN: SPECIAL EFFECTS TITAN and gain some insight into the working process behind the genius of Ray Harryhausen. To accompany the launch of RAY HARRYHAUSEN: SPECIAL EFFECTS TITAN Mr Ray Harryhausen will be making appearances across the UK. 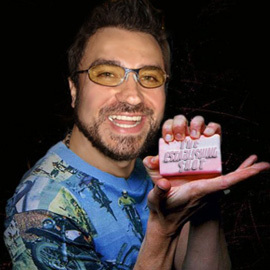 A link to his full schedule can be found below. Ray Harryhausen kicks off his UK tour with an appearance this evening at a screening of RAY HARRYHAUSEN: SPECIAL EFFECTS TITAN at the Gate Picturehouse Notting Hill and will host a QA session after the film. 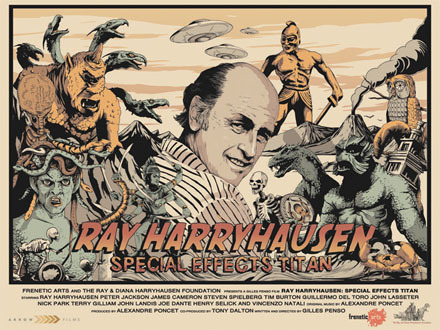 Picturehouse Culture Shock are thrilled to be screening the premiere of RAY HARRYHAUSEN: SPECIAL EFFECTS TITAN, but what's more, we are ecstatic to announce that Ray himself will be here to introduce the film at 6.30 on Friday 9 November. Following the screening, we will be joined by producer Tony Dalton and a VERY SPECIAL GUEST for a Q&A session. Much-loved SFX maestro Ray Harryhausen – who dazzled audiences with his stop-motion wizardry in the likes of 1963’s JASON AND THE ARGONAUTS - receives a fitting tribute in this definitive documentary about his life and work. Aside from conversations with the great man himself, shot over five years, there are also interviews and testimonies from Vanessa Harryhausen, Tony Dalton, Randy Cook, Peter Jackson, Nick Park, Phil Tippet, Peter Lord, Terry Gilliam, Dennis Muren, Rick Baker, John Landis, Ken Ralston, Guillermo Del Toro, Jean-Pierre Jeunet, Robert Zemeckis, James Cameron, Tim Burton, Steven Spielberg and many more. For the first time, Ray and the Harryhausen Foundation have provided unprecedented access to film all aspects of his work. They include models, artwork and miniatures, as well as Ray’s private study, where he designed most of his creations, and his workshop, where he built them. In addition, the documentary features previously unseen footage of tests and experiments found during the clearance of his LA garage. Never before has so much visual material been used in a documentary on this magician of special effects.